The first Chinese-Pakistani strategic dialogue between the two countries' foreign ministers and the first meeting to boost inter-party consultation on cooperation to build the China-Pakistan Economic Corridor (CPEC) was held in Beijing on Tuesday. As agreed by the two sides, the dialogue was co-chaired by Chinese State Councilor and Foreign Minister Wang Yi and Pakistani Federal Minister for Foreign Affairs Shah Mehmood Qureshi. The two foreign ministers agreed on a series of issues including the China-proposed Belt and Road Initiative (BRI), counter-terrorism, Afghanistan and easing tension in South Asia. According to the website of the Chinese Foreign Ministry about the dialogue, both China and Pakistan agreed that the peace and stability of South Asia serve the common interest of countries in the region, as well as the common expectation of international security. China praised the constructive efforts of Pakistan to ease the tension and urged Pakistan and India to keep self-restraint and solve divergences through peaceful measures, Wang said at the meeting, according to the ministry. Chinese Vice President Wang Qishan also met Qureshi on Tuesday. Wang said the friendly relationship between the two countries has stood the test of the times and the changing international situation and that he hoped the two countries would continue to deepen all-round cooperation, the Xinhua News Agency reported. Pakistani representatives who attended the CPEC meeting held before the dialogue on the same day said that China-Pakistan cooperation on the corridor does not target any third party, and India, as a neighbor to China and Pakistan, should understand that economic development in Pakistan can also benefit India's economic development. The corridor is facing a security threat from terrorist attacks supported by hostile "foreign forces" and China and Pakistan should enhance counter-terrorism cooperation, Pakistani attendees said. 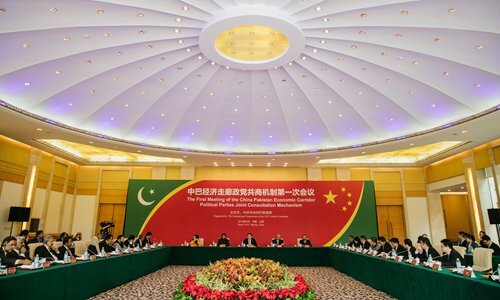 Nine political parties from Pakistan attended the First Meeting of the CPEC Political Parties Joint Consultation Mechanism (JCM) held by the International Department of the Central Committee of the Communist Party of China (CPC). Qureshi said that Pakistani Prime Minister Imran Khan and President Xi Jinping will stand "shoulder by shoulder" to tell the stories of success of the CPEC at the second Belt and Road Forum for International Cooperation in April. A Beijing Declaration in support of the BRI and the CPEC project was adopted by the CPC and the Pakistani political parties on Tuesday. The declaration also said that a second JCM meeting will be held in Pakistan. At the meeting, Song Tao, minister of the International Department of the CPC Central Committee, hailed the mechanism as an innovative move to deepen relations between the CPC and political parties in Pakistan. Song stressed that the CPEC belongs to no political party or government, but is a common treasure of the two peoples. The corridor faces security challenges, despite benefiting people in both countries. On November 23 2018, a terrorist attack against the Chinese Consulate-General in Karachi in South Pakistan killed seven people including two policemen, two civilians and three terrorists, Xinhua reported. Rana Ali Qaisar, general secretary of the International Department of the National Party of Pakistan, told the Global Times on the sidelines of the meeting that poverty and a lack of education contributed to some people being recruited by terrorist groups. China has done a lot to improve the living standard and education of Pakistani people and the Pakistan government needs to make more efforts to let more people share the benefits of the CPEC and then the soil for growing terrorism and extremism would be destroyed, Qaisar said. Mushahid Hussain Sayed, Pakistan Muslim League-Nawaz (PML-N) leader and chairman of the Senate Foreign Affairs Committee, told the Global Times on Tuesday that to protect Chinese projects and Chinese citizens, a special security division of 15,000 troops has been established. Sayed said that the attack on the Chinese consulate in Karachi was from the outside. As for India's concerns about China-Pakistan cooperation, Pakistani politicians said they welcomed India to join CPEC and that the economic development of Pakistan would also make India safer. "We want India to join the BRI. China is a peaceful country. China has never attacked anyone, and China has never conquered anyone. I think it will be win-win cooperation if Pakistan, India and China all cooperate to build a better tomorrow for the region and for Asia," Sayed said. He also noted that the CPEC was not against anybody. "It is for everybody and nobody loses out or is excluded," he said. "If India wants to cooperate with Pakistan on energy…why not with China on CPEC?" Sayed said. "We offer this to them. Welcome to CPEC. Welcome to BRI." National Party politician Qaisar argued that India needs to understand that economic development in Pakistan could destroy the soil for terrorism in both Pakistan and India. "India is not our enemy. We want to be friends," he said.